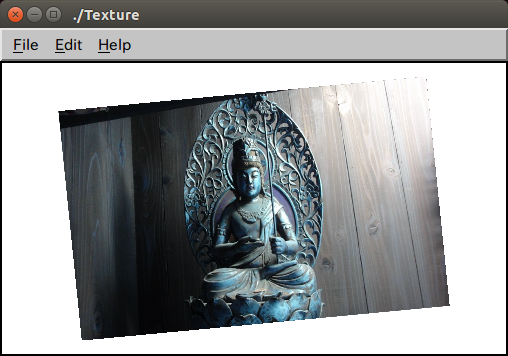 The advanced image support of Motif is also helpful to create an OpenGL texture from an image file of PNG or JPEG. The following Texture program is an example to create an OpenGL texture from a pixmap loaded by using OZ::PixmapFile class which is implemented based on XmGetPixmap API of Motif 2.3. //Copyright (c) 2016 Antillia.com TOSHIYUKI ARAI. ALL RIGHTS RESERVED. // 2016/08/27 Updated to use OpenGLApplication instead of Application. Copyright (c) 2000-2017 Antillia.com ALL RIGHTS RESERVED.